From online retailers suggesting new items based on past browsing habits to cities using traffic reports to pinpoint which roads would benefit most from an extra lane, data provides actionable insight to all types of organizations. Data science professionals are the masters of data, finding valuable knowledge where others see only numbers and figures. An online degree offers the flexibility and high-level education needed to join this dynamic career field. 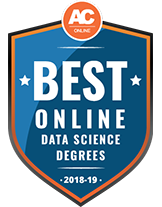 Continue reading to learn about online data science degrees, including program types, tips for choosing a college, and career options. An online degree in data science can help students take the first steps toward entering a career that teaches them the area-specific information needed to excel in the field. Many schools now offer online learning opportunities so students have the flexibility to complete their degree when and where works best for them. To help students find the best online data science program, we have ranked schools across the country based on specific criteria including cost of enrollment, class size and graduation rates. See who made the list for 2018 below. Baker College offers an online Bachelor of Science in computer science with a concentration in database technology. Students in this 120-credit hour program will learn Oracle database software, including programming and administration, to prepare for careers as database administrators. Baker's online programs can be completed without students needing to step foot on campus, and are delivered asynchronously so that students can complete their work at times that are convenient, as long as they meet the prescribed assignment deadlines. Western Governors University offers an online Bachelor of Science in data management and analytics. This degree prepares students to work as data scientists or data analysts. Students learn how to take raw data and turn it into actionable information. Coursework is updated regularly by industry experts to ensure students are learning the best and most up-to-date practices. The BS program provides training in database management, data wrangling, analysis and visualization, and includes industry-recognized certifications such as Oracle, CompTIA and CIW. Each online student is assigned a Program Mentor who provides guidance and support from the start of the program all the way to graduation day. At the end of the program, students will need to demonstrate their competencies through a final capstone project. The bureau of labor statistics provides the following data about job growth in the Data Science industry. As well as the following national median salary data for several different careers in the field of Data Science. Source: Bureau of Labor Statistics Note: Data engineer stats comes from software developers and business analyst stats comes from management analysis. Students have the option to choose between traditional on-campus learning and off-campus online degree programs. Students who choose online data science degrees receive a higher level of flexibility in their degree plan versus traditional students. Students interested in earning a data science-related degree do not have to stress about the quality of online education; data science curriculum is similar across most online colleges. Online programs and data science degrees are suitable for college graduates and returning students alike. Students enrolled in online data science programs do much of their coursework online using a variety of learning methods and platforms. From live discussions to simulations and projects, students are able and encouraged to interact and build relationships with their peers and educators. Platforms available online usually allow students to log in and complete course work when it is most convenient for them within the deadlines outlined by the coursework and syllabus. Using technology to obtain a data science degree applies directly to the use of technology and data. Social networks help students stay in touch through support and study groups. In addition to online work, most data science students complete a capstone course, which requires in-person work in a laboratory or other approved location with numerous hours of concentrated hands-on work and research. Online data science degrees are offered at many academic levels, from certificate to doctoral. Prospective students should choose the program that best meets their career goals. An online bachelor’s degree in data science is often offered part-time as well as full-time. The program is ideal for a student just out of high school or someone looking for a career change who is interested in data, analytics, computer science and statistics. A bachelor’s degree in data science requires the standard core curriculum and numerous courses in data science. Some programs may specific areas of sub-study, such as business analytics or data engineering. Master’s degrees in data science are available full or part-time. Students have the option to choose a variety of study concentrations for specific industries and careers. Programs normally require a capstone involving hands-on laboratory work with data and analytics. Master’s degrees are typically designed for individuals who already have some work experience. This program allows students the opportunity to prove to their employer that they are serious about advancing their career. Doctoral degrees in data science are ideal for individuals who are looking to become experts and thought leaders in data science. The programs usually take three years to complete with emphases on big data, computer science and data mining. As the world becomes more and more data-driven, a doctoral degree in data science may be an important stepping stone to advance a scientist’s or analyst’s career to the next level. Doctoral programs typically include research and dissertation in addition to coursework. This program is ideal for experienced data science professionals, seeking to further their credentials in niche data science markets. Students will learn how to extract information from large datasets and understand and apply strategic decision-making tools based on data. Programs typically take a year or more to complete and may have prerequisites. Strategy managers, scientific researchers, medical researchers and data consultants may benefit from certification study as well. Students in business analytics and intelligence programs focus on how data affects business and management in real-world situations. A business analyst will help companies determine budgeting, where to make personnel cuts, how to maximize employee time and where to increase staffing to produce a higher ROI. Data engineering programs focus on database management, software programming and statistics. Using these skills, the engineering program guides students to create models of data to identify trends and develop new ideas for solving real-world problems. An emphasis in big data analytics focuses on the organization, restructuring and specialization of huge amounts of data in order to extract valuable information for decision-making at the corporate level. Students in computational analytics will learn about software development and database analysis and apply it to company problems. Tech companies and other large companies are hit with massive amounts of data every day, and a computational analyst is responsible for interpreting that data in a format that is understandable by the CEO and stockholders. Students on the economic analytics track will focus on applying data findings and analytics to solve problems in micro- and macro- economic areas, financing, banking and financial markets. Data science programs with an emphasis in mathematical analytics focus on the use of mathematical theories and practices, such as differential equations and calculus to solve problems and extract information from large amounts of data. Students in the information systems concentration focus on technology planning and systems. Students will learn about designing, developing and implementing different technological systems to solve business problems. Students with a concentration in data mining explore new ideas in data mining and machine learning, applying it to business, science and technology. Data miners will work to find trends and work on new ways to sort data to help their company relate to customers, create better products and identify industry trends based on region, type of customer, yearly trends and other statistical data. Dataset Organization and Management Covers the structures of databases and the management of those databases in order to extract information. Students learn concepts such as local and distributed access, the analysis of datasets and security. Mathematical Modeling Focuses on using standard mathematical techniques such as graphing, probability, statistics and verbal to explore data. Students use mathematical skills to solve problems and analyze technology and data. Applied Machine Learning Combines computer science and statistics to work toward advancement in technology. Students have hands-on experience with different products and problems, applying their knowledge of probability, mathematics and statistics to make recommendations and find solutions. Software Design and Development Software design and development examines the theory and practice of analyzing systems and design. The course provides students with knowledge and hands-on practice to design information systems used to improve a business model. Data Communication Data communication studies technologies used in local and global networks. Students learn the technicality of network communication including configuration, installation, security, troubleshooting and design. What are the requirements of the school? Do you need a certain GPA? Test scores? Make certain you meet requirements and deadlines. Does this school fit your needs? Make sure the school you are choosing is in line with your lifestyle and career goals. With the multitude of specializations and emphases data science has, it is important to make sure the program you are choosing matches up with the area you wish to study. Get involved. Schedule school visits and see if current or prospective students have any advice, tips or groups you can join to understand student life. Look into any scholarships and/or financial aid offered by the school. Create a budget plan, ensuring you can cover the costs of tuition. Make sure the school is accredited. There are different accreditation organizations for different states and degrees. Make sure your prospective college is accredited in the state where you will work if pursuing an online degree. Before choosing a data science college, prospective students should check each school’s accreditation status. Accreditation evaluates the credibility and level of different schools, and employers often will not hire prospective employees from non-accredited colleges. A degree earned through a non-accredited school is worth much less than an accredited degree, and in most cases, will not provide the same career advancement opportunities as an accredited degree. 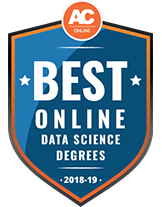 Online data science degree programs are usually accredited by the same organizations as other computer science fields. Students can ensure they are fully prepared for the next stage in their education journey by outlining the steps and time frame needed to reach their career goals. Important dates and deadlines must be met during the application process. The chart offers a brief outline of a schedule that shows the steps involved in applying for an online master’s degree in data science. In addition to the enrollment plan outlined above, students can take additional steps to enhance their chance of getting accepted into their desired online data science degree program. Take a computer science course and learn languages such as R or Python. Sharpen your math skills in high school or undergrad classes, specifically in the area of statistics. Consider joining a professional organization, like the Data Science Association or the American Statistical Association. Start an entry-level job in analytics or information systems to build relevant professional experience. Online degrees in data science offer a vast job market for students. Careers in data science are available at all levels, from entry to CEO. Most research scientists hold a master’s or doctoral degree in data science. Computer and information research specialists work on new software, systems and technologies and look for improvements for existing technologies in industries such as business, medicine and science. Research scientists use their expertise in technology and data to solve problems and discover solutions for real-life problems. Database administrators use software to organize and analyze data for large companies and organizations. They maintain the security of the networks and manage all data for their company. Data engineers are responsible for developing, testing, creating and monitoring databases, processing systems and software. They are the back-end of data and are generally proficient in coding systems and tools. Data engineers work to create systems to solve different problems and manage data more effectively. Operational research analysts use their knowledge of analytics and mathematical practices to solve issues within organizations and businesses. Operational research analysts create an efficient and cohesive work environment by applying their knowledge of data and technology to business daily practices. Information security analysts develop and implement security plans and systems to protect a company or organizations networks via computers and other systems. Information security analysts may work for businesses, financial institutions, computer companies or consulting firms. This certification requires professionals to be well-versed and in the data science industry upon entry. The program focuses on analyzing data and using it to solve problems. This certificate is offered by The Institute for Operations Research and the Management Sciences (INFORMS). It emphasizes data and how it relates to problems and analytics including model building. This certification must be renewed every three years. The EMSDSA certificate specializes in big data analytics and data science, allowing students to become certified as Data Scientist Associates. This certificate focuses on big data. Being certified as a CCP Data Scientist is a certification program designed for individuals already knowledgeable and practiced in data science. Students who enjoy the technical side of data science could look into a degree in computer programming. These programs focus on computer systems, software and networks. Students who prefer creating systems to improve processes may prefer a degree in software engineering. Software engineers develop new programs designed to facilitate company operations and streamline business practices at the executive, employee and customer level. The coding and design of online websites and networks is an in-demand career. Students with a strong interest in website design are the perfect candidates for a degree in web development.